The books on the shelves and in the catalogue are generally arranged in author/subject order. Books about a particular person are under that person’s name and follow any original writings, so writings by St Augustine will be followed by books about him. 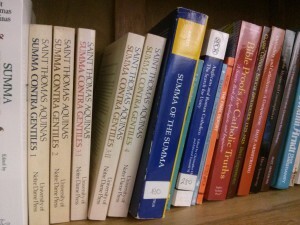 Books by and about saints are entered according to common usage: Aquinas for St Thomas, Bellarmine for St Robert. The catalogue has a limited degree of cross-referencing to aid the user. At the end of the main alphabetical sequence are three separate sections: Bibles, concordances and commentaries; Liturgy; Catholic teaching which includes catechisms, Vatican Councils and official documents. Please sign book out in the borrowing book. When returning them, put them carefully in the “book bin”; do not put books back on the shelves.